Art by Catharina Engberg: Flat and done! It helped leaving my brushes and paints and stuff on the kitchentable! As we say here in Sweden: "Med hjärtat i halsgropen"
I put it between two flat pieces of glas/plastic-board to dry flat. (on the backside of the painting!) to soak up the remaining water. I´m satisfied with the result. Hope you like it too! So happy that you wanted to stop by my blogg! Je suis heureux de voir ta nouvelle peinture. bel lavoro, rende vita al soggetto ! Bello"
Hi Catharina, so lovely to see you painting again! I feel that I have let my painting fall by the wayside lately so you have inspired me. 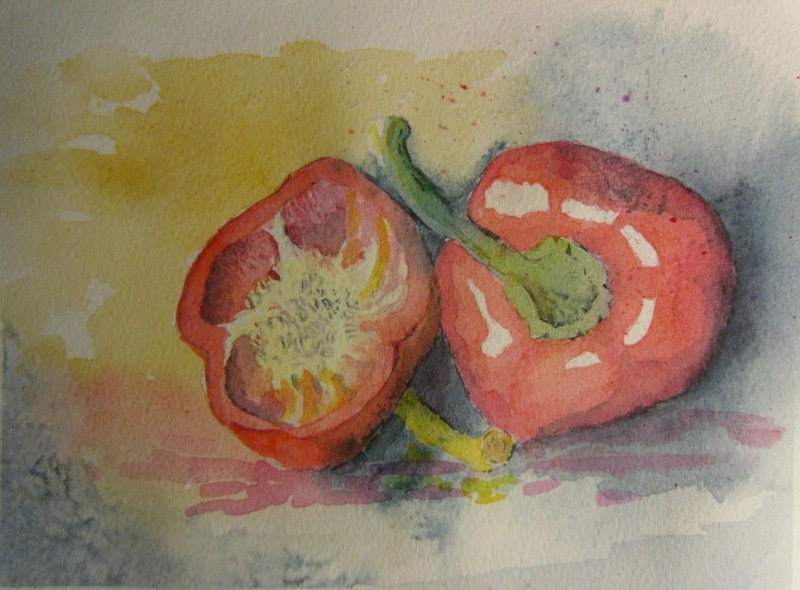 You've done a lovely job with the red capsicum! Thanks for your visit Wendy and hope that I inspire you to paint some more too. Catharina thank you for your recent visit to my blog and for your comments. I greatly appreciate it. Your watercolour is lovely. The reflections work very nicely. For flattening the painting i just spray mist the back of the artwork and then sandwich it between two hard surfaces such as a table top and a board. I then put all those art books i never read anymore on top as weights. Overnight should suffice. This way you won't risk those lovely colours running. Hope you are having a beautiful painting day. Blessings, Ross. Thank you Ingrid I will have a look! This is very good and I'm glad you succeeded in flattening it. Great work!! I HOPE I can stay with it John. My trick right now is to leave all the things on my kitchentable. I can´t leave it there for ever, but maybe a little now and then. Thank you for coming by! thank you for visiting and commenting on my paintings. Your paintings are lovely. Watercolor is such a challenge;i just can't get over the ability to paint over mistakes and the freedom acrylics give me. I suppose it is because i am an impulsive emotional painter. Happy painting. I am also impulsive when painting so I destroy alot of the paintings. It´s hard to stop in time! Thank you Renate! I´m glad it succeded. Beautiful painting with oh so difficult watercolor. I am so glad to see you visiting, so glad to visit you back. So glad to share the joy of painting and blogging. Un resultado muy bello y sugerente. Enhorabuena! Un abrazo.